The UNC LGBTQ Representation and Rights Initiative has published the first worldwide comprehensive report on transgender people serving in elected office. 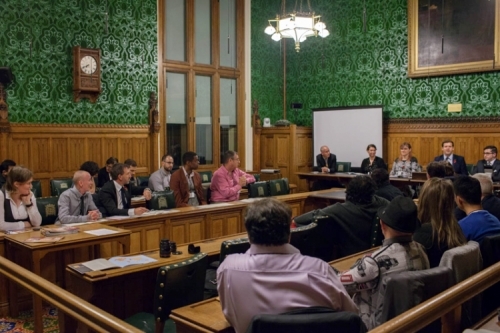 Andrew Reynolds and Logan Casey, along with other advocates for the global transgender community, presented their findings on trans* people in electoral politics at the British Parliament in November. It’s the first week of December, and much of America is watching Ted Cruz and Donald Trump hurl insults at each other. But a political science professor at UNC-Chapel Hill is keeping close tabs on some lesser-known political candidates in other parts of the world. In Australia, the first openly gay member of Parliament was just elected. Meanwhile, Venezuela just elected the first transgender woman to their National Assembly. Andrew Reynolds, director of the UNC LGBTQ Representation and Rights Initiative, updates his website to reflect these developments. He maintains a running list of all LGBTQ elected officials, all around the world, and he updates it constantly. “Just about every week, someone is elected, or someone comes out,” Reynolds says. While the list contains hundreds of openly gay, lesbian, and bisexual people, it includes only a handful of transgender people. The grand total of openly trans* people who have ever been elected to public office is 52. The UNC LGBTQ Representation and Rights Initiative published a report in November called “Standing Out: Transgender and Gender Variant Candidates and Elected Officials Around the World.” And when Reynolds tweeted about it, the impact permeated globally. “It almost crashed our website,” he says, smiling. The site was visited thousands of times, and hundreds of people downloaded the report. Reynolds recruited Logan Casey, a scholar and advocate on issues facing trans* people, to take on an unprecedented project with him: compile a comprehensive report on all the transgender people who have been elected to office — anywhere in the world, ever. Before beginning the project, Reynolds and Casey approached dozens of leading transgender advocates and groups from across the country and the world to ask: “Has anyone done this?” Specifically, they were trying to find out if anyone had ever counted the number of transgender people who have run for office. According to their sources, nobody had — but they all encouraged Reynolds and Casey to move forward with the project. Will all the trans* people please stand up? To begin their search, Reynolds and Casey asked trans* advocates and organizations to provide the names of people who had been elected to public office as openly transgender. They reached out to each name they received to confirm his or her transgender identity was public knowledge. Each person became a new resource, providing Reynolds and Casey with the names of other trans* people serving in public office. Until now. After combing through every country on the planet and over 40 years of history, they found that 126 transgender individuals from 30 countries have run in 209 races and been elected 72 times. The first time a community elected an openly trans* person happened in 1986 — Rachael Webb served on the London City Council for eight years. The most recent trans* person to be elected to public office is Tamara Adrián, Venezuela’s first self-disclosed trans* member of Parliament. Since the report has been published, more trans* people have come forward. Casey and Reynolds plan to publish a report with updated numbers in January. The impact of the report goes far beyond retweets and downloads. Casey and Reynolds traveled to London at the beginning of November to present their findings to the British Parliament. Reynolds draws a parallel between where transgender people are in politics today to where gay people were in politics 40 years ago. But he is careful not to make a direct comparison. “The gay experience, while far from identical, is a parallel experience and thus useful history for scholars and transgender activists alike,” he says. In the United States, LGBT representation in politics is shifting. In 2013, there were 120 LGB representatives serving in state legislators across the country. Now there are 97. “We’ve lost almost a fifth of them because people step down and they’re not being replaced.” Now that gay marriage is legal nationwide, Reynolds says progressive donors are “moving on” to other causes. Descriptive representation is a no-brainer, according to Reynolds. “You’re just less likely to be prejudiced if you know people who are gay or transgender,” he says. “So the impact of their presence in legislative bodies — your local school board, your national parliament — is even more powerful. Andrew Reynolds is the director of the LGBTQ Representation and Rights Initiative at UNC-Chapel Hill and an associate professor in the Department of Political Science. Logan Casey is a doctoral candidate in the Department of Political Science at the University of Michigan.